The Procter & Gamble Company (PG), together with its subsidiaries, manufactures and sells branded consumer packaged products worldwide. It operates through five segments: Beauty, Hair and Personal Care; Grooming; Health Care; Fabric Care and Home Care; and Baby, Feminine and Family Care. The company raised its quarterly dividends to 66.95 cents/share. 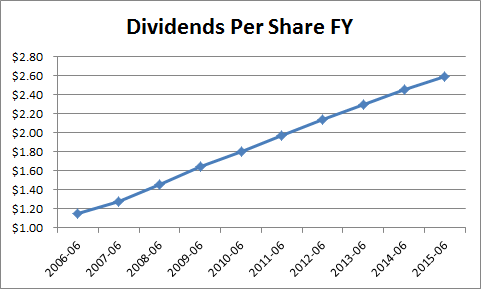 This marked the 60th consecutive annual dividend increase for this dividend king. There are only 18 dividend kings, which have raised dividends for more than 50 years in a row. Unfortunately, the problem with Procter & Gamble’s dividend increase was that it was only 1%. This was the slowest dividend increase I could find going back 46 years. It shows that things are not going as well as expected. The company is in the middle of a turnaround, and it is trying to streamline its operations and focus on a smaller number of brands. A lot of operations are set to be sold off. Throughout my experience as a dividend investor, I have learned that management usually bases their new dividend rates based on their business outlook. In the case of Procter & Gamble, it would seem that management sees the near term business outlook as grim. Since I hold a diversified dividend portfolio, the effect of P&G's slow dividend growth will be offset by other companies that grow dividends faster. As we all know, future dividend growth is dependent on consistent earnings growth. 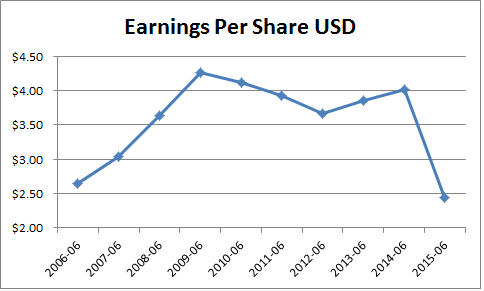 If we look at the earnings trends for Procter & Gamble, we would notice that earnings peaked at $4.26/share in 2009. The company has been unable to grow earnings per share for seven years in a row. 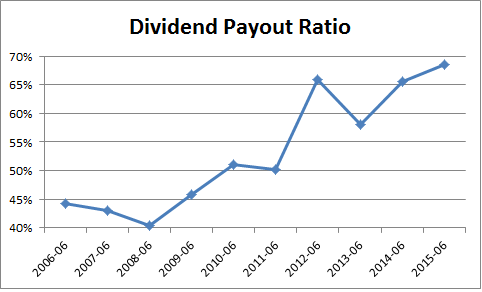 At the same time, growth in dividends has occurred mainly through the expansion of the dividend payout ratio. Without growth in earnings, there can be no dividend growth. This is why the rate of annual increases has been slowing down. That being said, as a holder of Procter & Gamble stock, I would keep holding on to it. At the very worst, I am paid a 3.20% annual yield to hold on to a potential turnaround. The thing is that nobody today knows whether Procter & Gamble will be able to grow earnings or whether they will remain stagnant for the foreseeable future. If I sold today, I am taking the risk that I am selling low and bought an investment that may do worse than Procter & Gamble. To put things in perspective, US stocks are expected to return something like 5% - 6%/year over the next decade, while bonds will not do better than 2% - 3%/year. When you put things in perspective of the current situation, things don't look as bad. For example, there are governments that charge you for the privilege of buying their long-term debt or even holding money in the bank. There are other companies that are high on promised future earnings and high on valuations, but low on actual earnings. Earnings on US corporations are in a so-called earnings recession. This is why it makes sense to hold on to a company that will return a third of its price over the course of a decade through dividends may make sense. At least P&G's earnings and revenues are somewhat more stable than the average company in the US, due to the nature of its business. The only sure thing from selling Procter & Gamble today would be paying taxes on long-term capital gains at the rate of 15% for federal tax purposes and paying a commission to sell. My broker would only charge me something like 35 cents to sell up to 200 shares of Procter & Gamble stock. So that being said, I will hold my shares, because turnover and too much activity is counterproductive to long-term returns. I would hold the shares for as long as the dividend is at least kept. I would sell all my shares the second after the dividend is cut - I do not fall in love with the companies I own, and I expect them to pay me more dividend income every year. It is interesting to observe how my stock selections do in real time after initial analyses. I still believe that many of the consumer staples companies have the distribution, the brands and the long-term customer relationships to keep doing well. I like the nature of repeatable sales to consumers of everyday consumer items. I still believe that there is opportunity in emerging markets, and also in some markets like the US, where the number of newborns is very close to the number of newborns during the post WW2 baby-boom. However, it is also possible that there are some changes along the way, with consumers switching to more generic versions of products which are cheaper and carry less profit for the manufacturer. Competition is high as well, while traditional methods of reaching consumers through advertising are becoming more fragmented. Therefore, it may be more difficult to reach the scale of mass advertising that a company like P&G might have had in the 1950s or 1960s for example. That being said, I would be allocating my dividend checks from Procter & Gamble elsewhere. I would not consider adding to my position today. If I were starting out today, I would not be initiating a position in Procter & Gamble. The reasons are that earnings are not going up, dividend growth is slowing down and the stock is selling above 22.90 times expected earnings for 2016 of $3.63/share. The stock, as well as many other consumer staples companies I own are selling at pretty rich valuations today. - What makes Consumer Staples the Perfect Dividend Growth Companies?